We tend to stay in remote locations with less than level camping spots. As a consequence, we've had occasion to need the skid bars mounted on the rear of our 2499. After a particularly difficult maneuver last October we bent one of the bars, but not much. I've seen metal wheels on the rear of some RVs and think maybe that's what we need. Does anyone have experience with these? Would they mount to the skid bars themselves or would it be necessary to cut off the bars and attach the wheels to the frame? Any advice is appreciated. Don, you cut the skid bars off and replace them with the wheels. 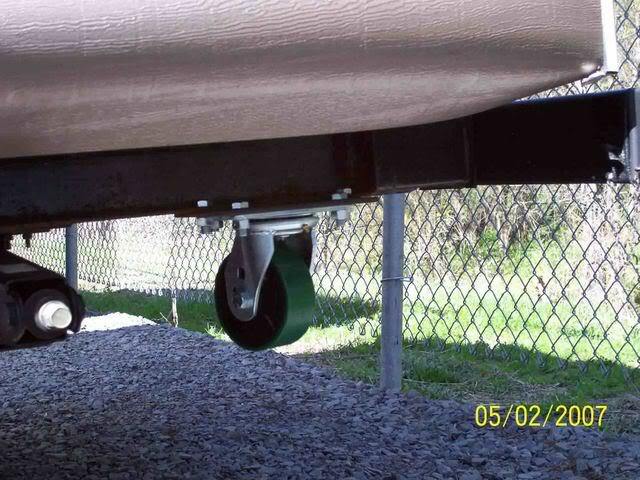 The casters (swivel style is preferred) are mounted to mounting plates and the plates are fastened to the frame. Most RV dealers carry them or can get them for you. If you plan to install them yourself, the wheels must be positioned along the frame so that they touch the ground at the same point that your skid bars do. I put casters on the back of our trailer, and they coincidentally were the same height as the skid bars so I placed them right in center of where the skid bars were mounted. If there is a difference between the height of the casters and the skid bars, you may have to adjust to positon a bit. 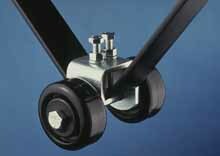 I bought 1,200# casters from Northern Products and fabricated my own mounting plates. I would not do it again. I burned up several expensive drill bits fabricating the mounting plates and probably ended up spending more money than the wheel set from a dealer would have cost. There are a couple of threads back a ways on this topic with pictures and lots of detailed information on the topic. Steve, thanks for the info. I think a set of casters is in our future. Here is the post Steve was refering to. We really got into this..... Hutch had posted pics of his which started the post. I haven't towed the trailer much this year, yet. I did hook up and tow it around the block to a level place so that I could determine what adjustments were needed to the ball height with the new TV. Turns out the trailer was nose high by about 4". When I went to back the rig into my driveway with the nose high, the rear casters really earned their keep. I installed a deep drop shank in place of the standard Reese adjustable shank and the trailer now sits level. I think the casters will still touch when parking in our very sloped driveway, but not to the exent that they did on my test tow. I need to make up a caster setup for mine. It bottoms out every time I turn onto our road. I try to take it real easy but it still scrapes. Then I cut off the skid bars and went with the swivel type skid wheels. I bolted mine on and the installation was easy. Installed a set on our current T-280SR. But more as a precaution. The 280SR sits much higher than the 2670 did, so the 280SR doesn’t drag. The 2670 dragged a lot and the skids wheels really helped. I did the same thing as Steve. The factory bars only lasted maybe a trip or two and then gone. I then purchased the caster wheels from Tractor Supply and then had them welded on at a local welding shop. I think I paid 30 or 40 bucks. My trailer always drags when pulling into gas stations or stores. These castors really help. The low profile of the trailer sure does tow nice but it is a "drag" when pulling into a steep drive.